Canon’s EOS 80D is the most recent release, in a very popular series of cameras that began with the EOS 10D. It represents Canon’s latest model in the middle of their camera range. Historically this series of cameras has provided many of the features of more expensive Canon full-frame bodies, but with a smaller APS-C sensor. 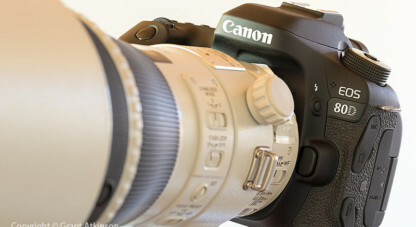 In the Canon range, the 7D Mark 2 has mostly higher specifications, in a more robust package, but shares the APS -C sensor size. However, as the 80D is a newer camera than the 7D Mark 2, it benefits from some of the latest technology and it outperforms the more expensive 7D Mark 2 in some metrics. The 80D is by far the most highly specified XXD Canon body to date, and one of the biggest upgrades is a powerful, new 45 point autofocus system which is highly configurable. It also has a fair degree of customisation built into it, and the powerful Dual Pixel AF system for shooting in Live View or movie mode. With these improvements comes a higher degree of complexity. In this post I will share my own default setup of the 80D, with my settings chosen with the kind of wildlife photography that I do as the main priority. Pressing the Q-button displays the main camera settings. I use M-mode, but only when I can combine it with Auto Iso (or I also use AV mode and TV mode with manual iso). From this screen you can see that the camera is set for Ai Servo (moving subject) focus, Single AF point, Evaluative metering and High Speed continuous drive mode selected. With those settings in place, I press the Menu button and then work through each menu tab. Starting with the first tab in the first Red menu, Shoot 1, I make sure to select RAW only and not jpg. As I prefer processing my own raw images, using Adobe Lightroom, I don’t need the camera to make jpegs. 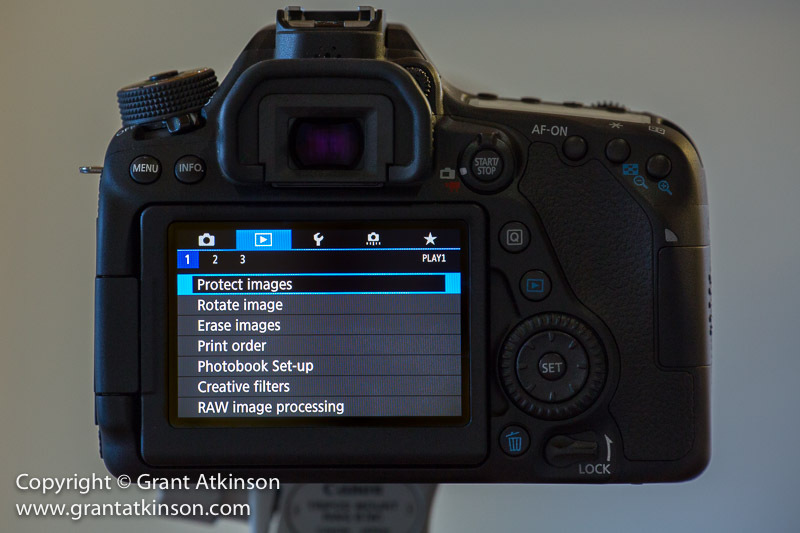 Keeping both RAW and jpeg selected will fill up the buffer very quickly and slow down continuous shooting capability. I set “Release shutter without card” to OFF, which means that the camera will not trigger the shutter if there is no card inside. 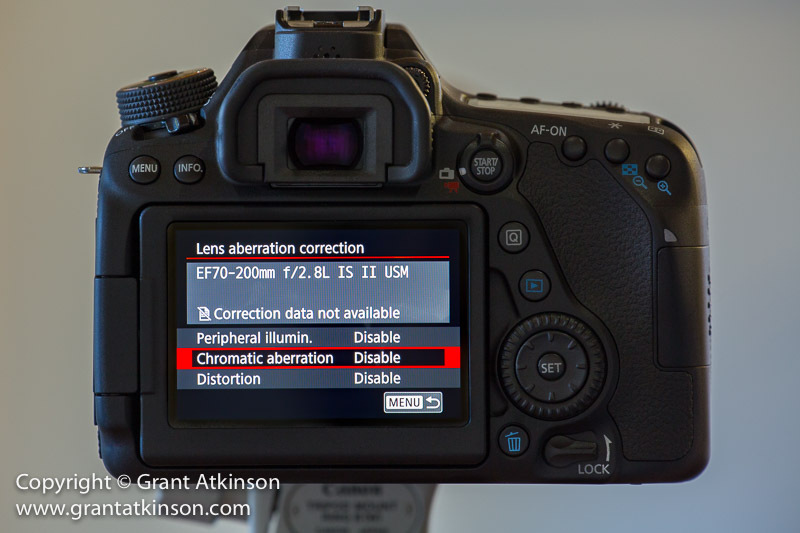 The “Lens aberration correction” gives access to a number of image enhancing, behind-the-scenes processing steps that make jpeg images look better. As I shoot raw only and carry out these processes myself in Lightroom, I have no need of them for the camera jpegs. Even if the 80D is set to RAW only, it will carry out these processing steps on each thumbnail jpeg it creates for the rear screen, using up processor power and impacting buffer and continuous shooting performance. It will also use up more battery power. After going into that menu option, I make sure to Disable all three processes. Disable Red-eye reduction, as it is not needed for wildlife. 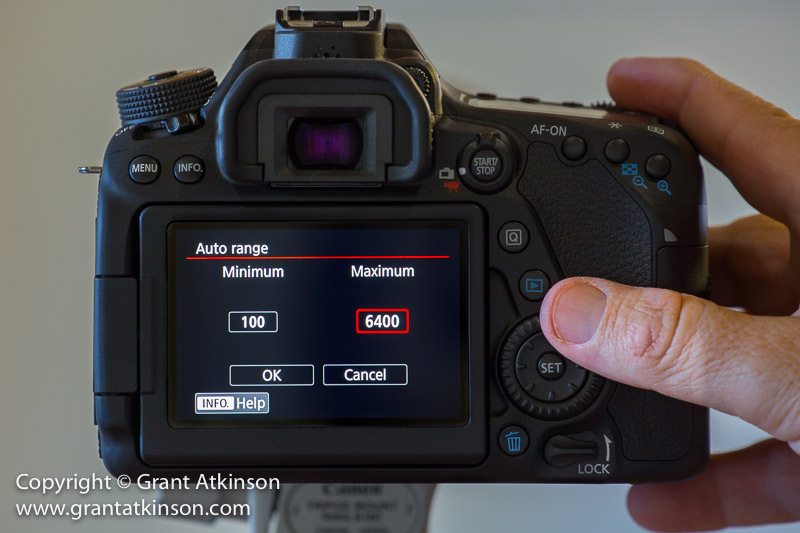 ‘Range for stills” allows me to set a lower and upper limit for manual control of iso, via the iso button or the rear LCD touch screen. I set the maximum iso to 6400 for my kind of wildlife shooting, though I prefer to not go over iso 3200 with the 80D if I can help it. I make sure to press the Set button after making my selections and the OK field to lock them in. I do the same for my Auto iso range, remembering that I will still keep a close watch on what iso settings the camera is selecting whilst I am taking images, by looking in the viewfinder. I use Auto iso on the 80D in conjuction with M-mode. The iso setting is then adjusted by the camera, in response to the shutter speed and aperture which are chosen by me. The actual iso setting for each exposure shows in the right side of the viewfinder whenever I half-press the shutter or on the back screen which enables me to keep track easily. Auto Lighting Optimizer is another image enhancing process that I prefer doing (Shadow slider) when processing my own raw images. Switching it to OFF maximizes buffer performance and battery life. I leave my 80D in Auto White Balance, AWB. However, the camera offers users two choices for auto white balance, aside from the regular presets. Accessed by pressing Set whilst White Balance is selected (from Shoot 2 menu) then pressing the Info button, left of the viewfinder. AWB gives a more yellow or orange tone to images whereas AWB W (the new option) produces images with the cleaner whites. Personal preference will dictate your choice. I prefer the AWB tones for the wildlife shooting I do. 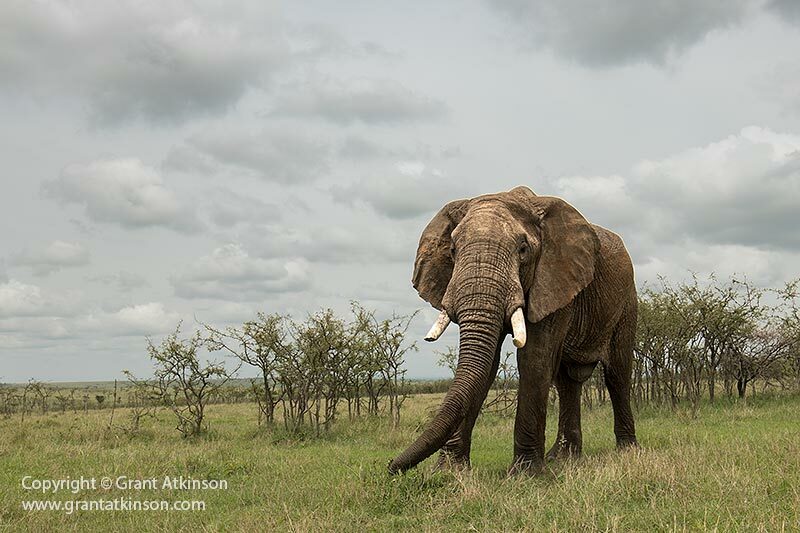 I find that all my Canon cameras tend to give too much of a magenta (purple) tinge to some of my subject matter like grey elephants. This is most noticeable to me when shooting in twilight conditions which I do a lot. As a personal preference, I shift my cameras white balance away from Magenta and toward Green. I do this by selecting WB Shift/Bkt from the Shoot 2 menu, and moving the slider one click upwards, locking in my choice with the Set button. This saves me a little time in processing. If I find that I am shooting in different situations where my images become too greenish then I just change it back. Default colour space is sRGB. This is good for a workflow where you are shooting images that will be displayed on the internet or on a screen. I prefer changing my cameras colour space to Adobe RGB which is a preferred colour space for print. During my raw processing, I will change the colour-space tag to sRGB for web images when I create them. In the third tab, Shoot 3 menu, I turn “Long exposure noise reduction” to OFF. This maximizes buffer performance and extends battery life. Similarly, I set “High Iso speed Noise Reduction” to OFF. I do the same for “Highlight tone priority”. All noise reduction and image enhancing processes I prefer doing myself with my raw images, and they consume battery power and impact buffer and continuous shooting when run in-camera. For the Shoot 4 menu, I just Disable ‘Interval timer”, as well as “Bulb timer” and Anti-flicker shoot. As I shoot outdoors, I have no need of the Anti-flicker capability normally. The Shoot 5 menu (Lv func) deals with Live View shooting for stills (rotating the Live View/Video switch will change this menu to Shoot 5: Movie to access Movie settings). For Live View AF method I choose FlexiZone AF which is represented by one Live View AF point that I can move by rocking the direction pad that surrounds the Set button or by using a fingertip to touch the back LCD. For wildlife photography I prefer having the accuracy that comes with the smaller, single focus square in this option. For “Touch Shutter”, Disable. Choosing Disable means that when in Live View, if I touch the rear LCD touch screen, the shutter will not trigger. I don’t make any changes to default Shoot 6 menu settings. The blue menu tabs all deal mostly with playback options, as well as some in camera jpeg editing. I make no changes to any Play 1, 2 or 3 menu tabs. Minimal changes to Set Up 1 menu tab, although I disable ‘Wireless communication settings” unless I intend to control the camera with another device. In Set Up 2 menu, I leave “Auto power off” set at 1 min. 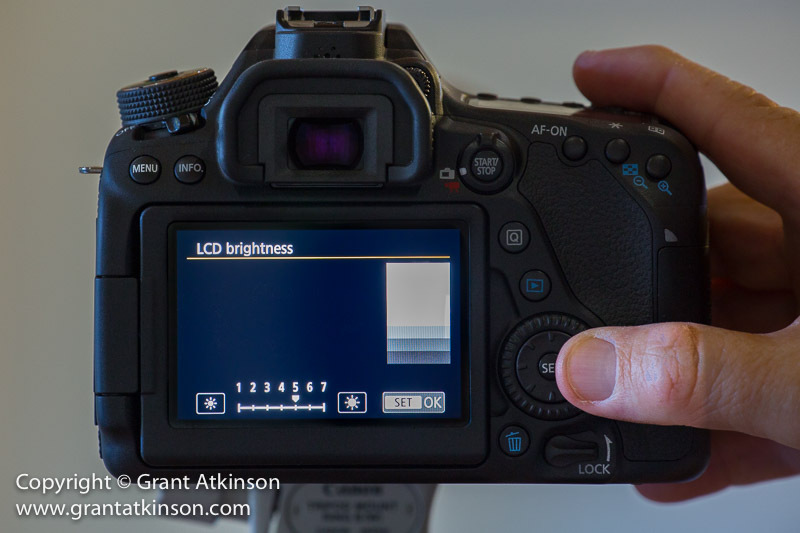 I go into the ‘LCD brightness” screen and move it from 4 to 5, making it brighter. This makes it easier to see for me, specially as I mostly work outdoors. I am aware that it does also use up more battery power. I set ‘Electronic level” to Show, and “Grid Display” to Show. Both the level and the grid are very helpful to me when looking through the viewfinder, in helping me get my images level in-camera. For ‘Flicker detection” I choose Hide, because I shoot outdoors. For indoor shooting, keep it on. In the Set Up 3 menu tab, I leave “Touch control” at the Standard setting. If, for some reason, you really don’t want the touchscreen function at all on the 80D, this is where it can be set to Disable. But I keep mine on Standard and use the touchscreen. There are three different screens that cycle, one after another, each time you press the Info button. You can uncheck the box if you have no need of seeing this screen. The middle screen is the Electronic level. Uncheck the box if you don’t need quick access to the level. The third Info screen option cannot be unchecked and it shows shooting functions. I keep all three of these boxes checked and am used to cycling through them quickly when I need to. In Set Up 4 menu, the “Multi function lock” can be configured in multiple ways. The lock control lever is located below the large rear command dial, on the back bottom right of the camera body. Options are there to use the Lock to act on any one of the following: The main dial (next to the shutter release), or the quick control dial, or the multi-controller pad (around the Set button) or it can lock out use of the Touch screen. Personal preference will dictate your choice. I don’t lock anything on the 80D with it. In the orange C.Fn (Custom Function) menu, I make one change in the Exposure group of settings. Within the C.Fn I Exposure menu, I leave the first 5 options at 0 settings, but make sure to engage Safety Shift, by selecting “1: Shutter speed/aperture”. What this does is temporarily move my camera into the equivalent of Program mode, allowing the shutter speed or aperture to “float”, if I should unintentionally present the camera with a very bright scene (that would otherwise have caused an overexposure to happen). Doesn’t happen often and less so when I am using Auto Iso, but there are times when it can save a mistake. The 80D has its autofocus settings all under the C.Fn II: Autofocus heading. Unlike the higher end models like the 7D Mark 2, and the 5D and 1DX series, the 80D does not have a dedicated Autofocus menu under its own tab. More important though, is that it has almost all of the essential adjustable parameters that are found in those cameras, just presented slightly differently and without the AF Cases. 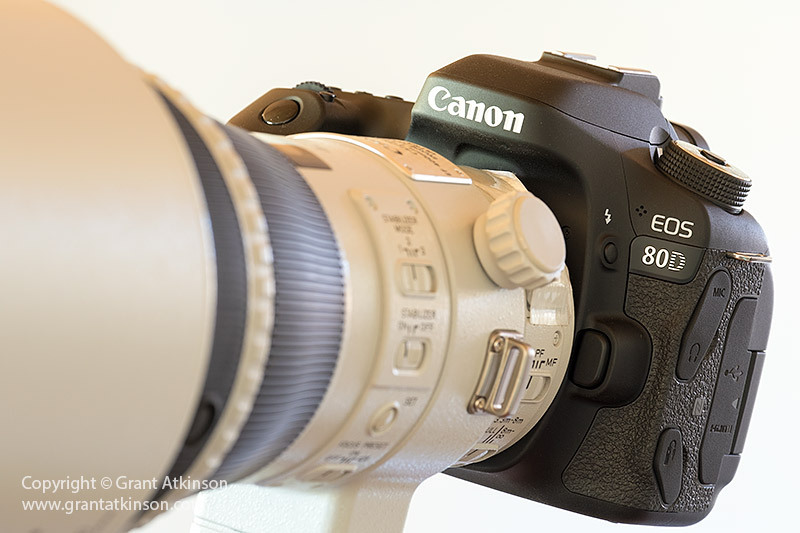 The 80D has by some margin the best autofocus system both in terms of its specification and configuration options, that Canon have ever put into a camera in this range. The section of this post dealing with why or how I set up my own autofocus is in-depth. If you prefer to not delve into the more technical elements of the system, be assured that the Default Autofocus settings work very well for a wide range of subjects. Going into the C.Fn II: Autofocus menu option opens up this set of 16 different adjustment screens, with a numbered tab right on the bottom. The first parameter is a very important one, called Tracking Sensitivity. This setting controls how long the camera will ‘wait’ before refocusing, when a new subject/object moves between the camera and the original subject, or if the active focus point is moved off of the subject unintentionally. An example of this is when you are tracking a bird, and the bird passes behind a branch, momentarily. With this setting on Responsive (+2), it is more likely that the AF will quickly lock onto the branch. If this setting is on the opposite, Locked-On (-2), it is likely that the camera will hold the focus for longer, without attempting to re-focus for long enough that the bird can once again be located once the obstruction has passed by and out of the line of sight. Another example of how this parameter can be of use, is for those times when you are tracking a moving subject with an active AF point on that subject, and you accidentally move the camera so that the active AF point drops off of the subject. With Tracking sensitivity set to -1 or -2, there will be more time available for you to re-locate the subject, without the lens having focused on the background. The image above is an example of such an instance. My Single AF point was right in the middle of the frame, with blue sky behind it which was my mistake, but the camera did not immediately try to focus on the blue sky background, rather remaining focused on the African skimmer, and allowing me to capture the focused image sharply. 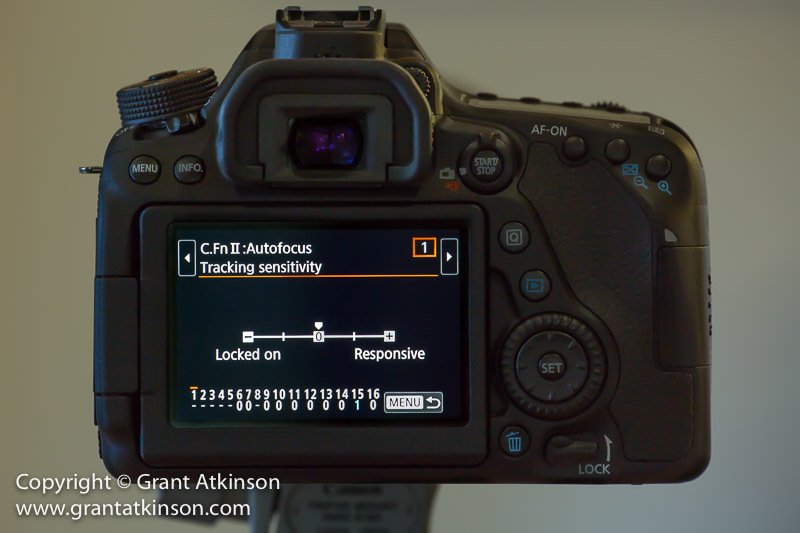 Canon do mention that with Tracking Sensitivity set to the Locked-On side of the slider, it may take the AF a little longer to re-aquire focus if focus is lost. Canon also state that initial AF acquisition is not affected by setting Tracking sensitivity to Locked-On (-1 or -2). Despite what Canon have stated, it is my feeling that having the camera set toward Locked-On, either -1 or -2, may result in slightly slower AF response if a subject is coming directly toward the camera at high speed. If I expect to be shooting oncoming subjects a lot, I may keep the Tracking Sensitivity on 0 or +1. Tracking sensitivity is definitely one of the the most important of the adjustment parameters described here in that it can make a noticeable difference to how stable Ai Servo AF tracking is if you move it towards the negative settings, or Locked-On side of the slider. It can also speed up the AF systems responsiveness if you move it toward the plus or Responsive side of the slider. 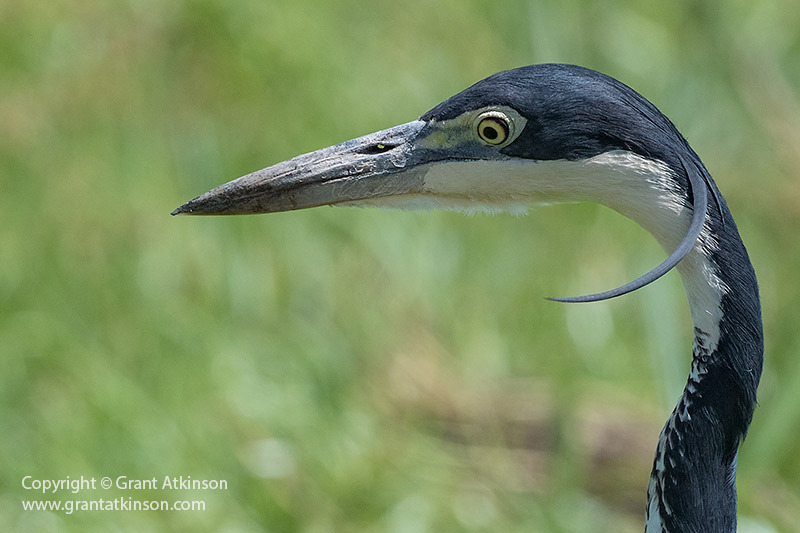 In my experience, I find myself more likely to slow down Tracking Sensitivity (-1 or -2) when I am using focal lengths of around 400mm and upward, and only if I feel that I am dropping focus off the subject too often. 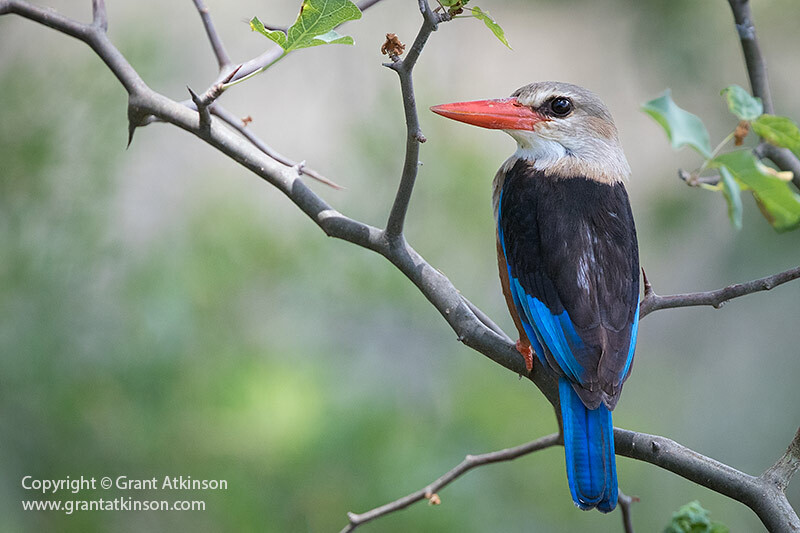 When I am working with lenses with shorter focal lengths, 400mm or less, I may leave Tracking Sensitivity on 0 or even +1 if I am expecting really fast, approaching subjects. With shorter focal lengths, it is much easier to keep the focus point/points on the subject, and also easy enough to relocate the subject even if I do move the point away momentarily. This setting allows the AF to be optimized to capture fast-moving subjects that might suddenly stop, or move in a random direction, or rapidly speed up or slow down. The 0 setting for this parameter is suited for tracking subjects that move at a steady speed. Most of the subjects that I shoot accelerate or decelerate whilst I am tracking them. Also, if I have a subject coming towards me, even if that subject is staying at a steady speed, I have to allow for the relative increase in speed the closer to me that subject gets. Think of trying to track a bird flying towards and right by you…your panning motion has to speed up dramatically as the subject gets closer to you and actually passes by. As I like to try and shoot fast moving subjects whenever possible, I either leave this setting on (0) or on (+1) with good results. According to Canon, setting it to (+2) will make it very responsive but also a bit less stable. At the time of writing I have not found need yet of using this setting on (+2). If you are a photographer that prefers to always use the camera in Single AF point mode, then you can disregard this parameter. It’s function only applies when shooting with those AF mode options that utilize more than one AF point, so that would be Zone AF, Large Zone AF and 45 Point AF on the 80D. When you are shooting any one of those AF modes, there may be situations where the AF point that held initial focus is no longer on the subject, due to subject movement or camera movement. In such instances the camera then hands focus over to the next adjacent AF point which detects the subject and takes over tracking. This parameter, AF Point Auto Switching, determines how quickly or slowly that handover from one AF point to the next, takes place. On the 80D I have not had need to move this setting beyond (0) which is the default setting. This parameter controls how much time is allowed for focus to take place in Ai Servo before the shutter fires, but applies only to the very first image in a burst. It is an important adjustment slider. The options on the slider go from Release on the left, to Focus on the right. Moving the slider left, to the Release position, will reduce and limit how much time the camera will allow for focus to take place before the image is taken. The amount of time allowed will only be that which is needed for the camera to fire at its selected frame rate which is 7 frames per second at the maximum. With the slider in the Release position, focus tracking will only take place for a limited time, but it will take place (there seems to be some confusion amongst photographers whether focus takes place, but it always does). However, once the allocated time is up, the camera will fire the shutter regardless of whether focus was confirmed or not. Moving the slider all the way to the right, to the Focus position, will mean that in Ai Servo, the camera will allow as much time as needed for focus tracking to confirm BEFORE it allows the shutter to fire. In reality, what this can mean is that in difficult focus conditions, such as subjects and backgrounds that are similar, or very high speed movement, or very low light, the frame rate of the camera may slow down significantly to allow the extra time for focusing. Simply stated, focus tracking takes place for both the Release option or the Focus option, but with Focus, more time is allowed when needed. Again, it should be remembered that the setting you choose on this screen applies to the first image in a burst only. Your own preferences may differ according to your choice of subject matter and your own shooting style. I always choose Release on any of my Canon dslr bodies, for the “Ai Servo 1st image priority”. I know with Release enabled, that I am able to get off my first shot quickly, and with little hesitation. Whilst setting the option to Focus priority is likely to increase the percentage of in-focus first images, it can also increase the amount of time that it takes to get the first shot off. Canon recommend the use of the Focus priority setting in very low light situations. C.Fn II: Autofocus 5 is the control parameter for Ai Servo 2nd image priority. It allows you to biase your AF timing, either toward speed or focus priority for the second image and every subsequent one in a burst. 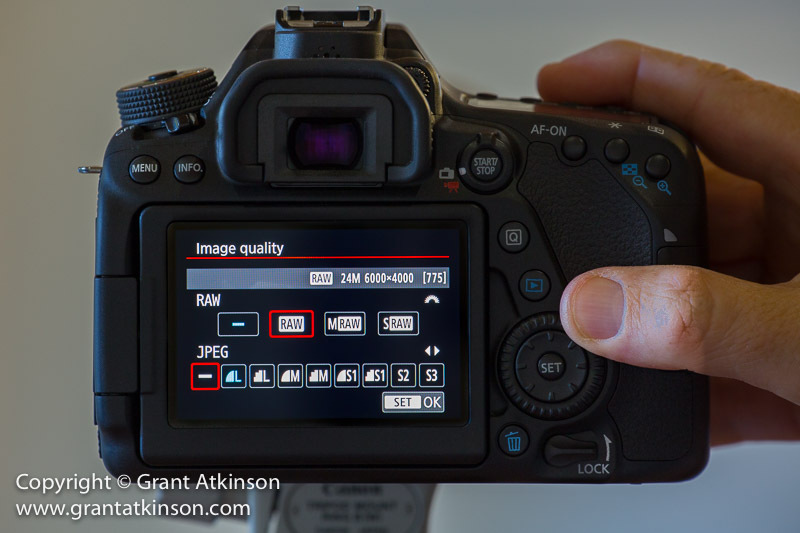 Once you lift your finger up off the shutter button, it signals the end of that burst, (and 2nd Image setting), and the next image taken will then be the first image in what the camera sees as a new burst. 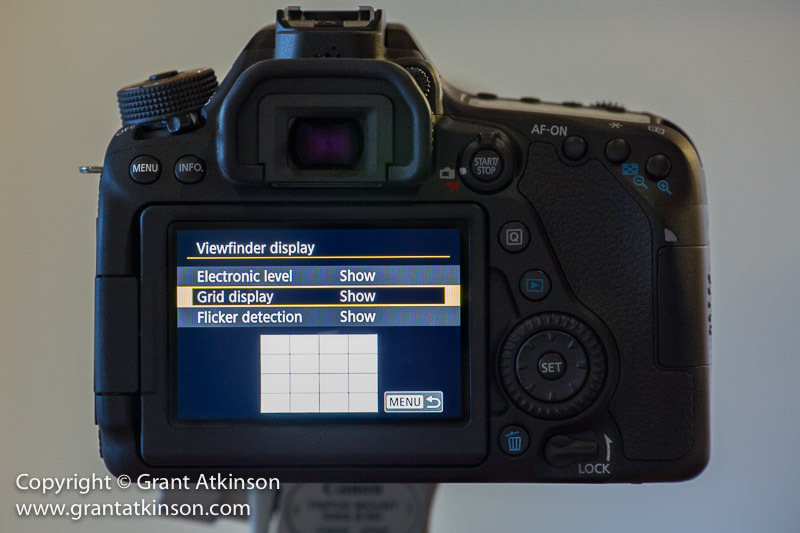 This is another important slider for fine-tuning the 80D focus system. 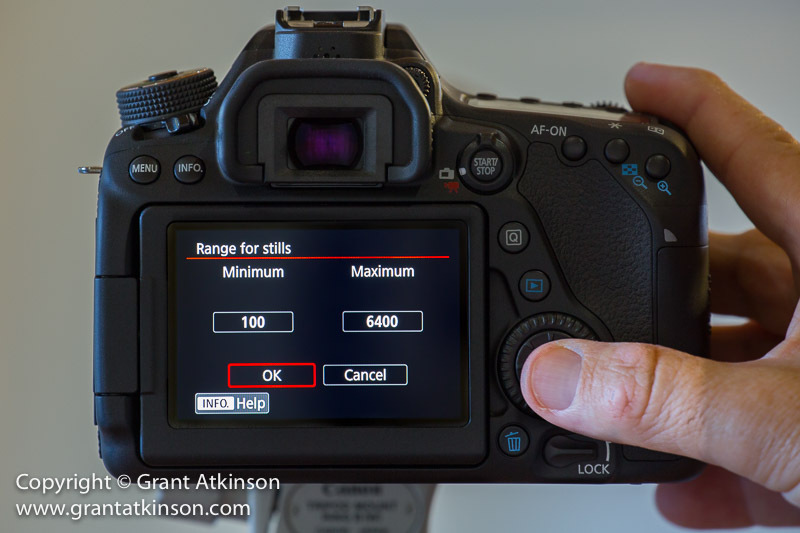 With two separate sets of controlling sliders, Canon make it possible for you to configure your camera AF timing exactly to your own liking, and to tailor it to different AF shooting situations. 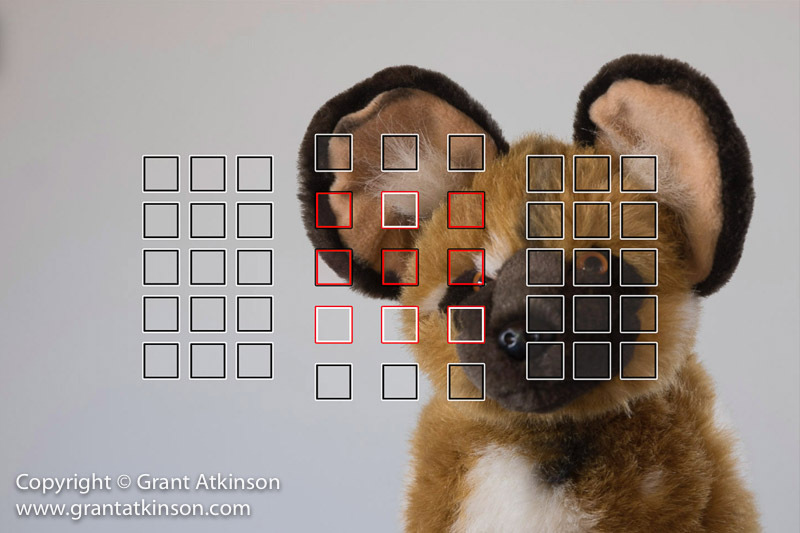 With this slider, you are again choosing how much time is allowed for focus to take place between each frame in a burst, after the first image (the timing of which is controlled by Ai Servo 1st Image Priority setting). Moving the slider to the left, to the Release position, limits how much time the camera allows for focus to occur before the image is taken. The time allowed being only what is needed for the camera to fire at its selected frame rate (which may be up to 7 frames per second). In the Release position, focus tracking will still take place, (as it always does). The difference is that once the allocated time is up, the camera will fire the shutter regardless of whether focus is confirmed or not. Moving the slider all the way toward Focus, will result in focus being heavily prioritized with every frame from the second one onwards in an Ai Servo burst. The camera will delay firing until it confirms focus, or as close to it as it can come. This should result in more in-focus shots in a burst. However, choosing this option can also result in the 80D slowing down during a burst, and the frame rate changing. This may happen in response to difficult conditions where it is difficult for Ai Servo AF to confirm focus and is perfectly normal. If you are not accustomed to it, it may feel as if the camera is lagging behind the shutter release. Canon recommend the use of this setting for very low light situations, to improve tracking accuracy. The middle setting on this slider represents an equal balance with 0 being an equal balance between release speed and focus priority. I find that for my own shooting preferences, I tend toward opting for the 0 choice here with the 80D, or I may move the slider left to Speed if I find that the camera’s burst performance is sluggish. If I I am getting too many shots from bursts that are not properly focused, then I may move it back to 0 (Equal priority) again. C.Fn II: Autofocus 7 is an important setting, “Lens drive when AF impossible”. Setting the camera to “0: Continue focus search” means that if my lens becomes deeply out of focus, the camera will continue to drive the focusing elements back and forth until it can acquire focus. This setting becomes more important when using long focal lengths, like 500mm and upwards. The 80D has a 45-point autofocus grid, which extends quite far towards the sides of the frame. 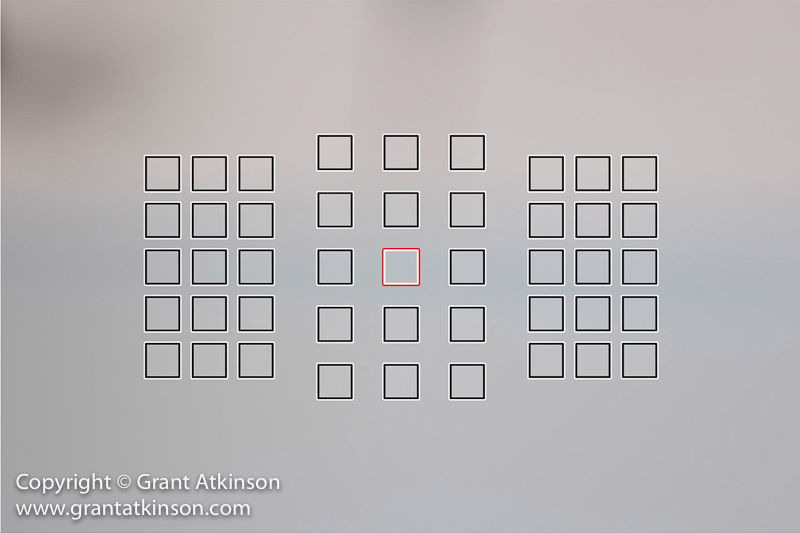 There are four different autofocus point groupings, as seen through the viewfinder. These are : Manual Select Single Point AF, AF Zone, Large Zone AF and Auto Select 45-Point AF. My own preference with this camera is to use the manually selected, Single Point AF, as shown above, (though the points appear black in the actual viewfinder). With Single Point AF, I get accurate placement of my selected AF point when I need to be precise, and focus on my subjects eye, which is a norm for wildlife photography. With static subject or slow-moving subject matter, I am confident of the accuracy of even the outermost AF points in the grid, even when using a lens with a 5.6 aperture like the EF 100-400L f4.5-5.6 IS ii. However, if I expect a subject to be fast-moving then I usually move just one row in from the outermost autofocus points. I find that I get a better keeper rate of sharper shots by working like this, when I remember to do it. Light from the lens typically falls off a little toward the edges of the image circle, which may account for my lower level of success when selecting the outermost points for rapid subjects. C.Fn II: Autofocus 8 allows you to choose which of the four autofocus groupings to keep available when you cycle through them. If there are any of these four groupings that you don’t use, unchecking that option here will mean it does not show up when cycling through the different choices, saving you time and limiting the risk of choosing the wrong one. On my 80D I usually just keep Single Point AF and AF Zone available. I disable the other two. Whilst 45 point autofocus has its advantages, it limits the control I am able to otherwise maintain of where my camera focuses in the frame so I don’t normally use it. If you photograph slow-moving, large subjects then 45 point AF can be useful. Keeping this setting on 0 as I do means that I can directly select the different focus groupings (Single Pt AF and AF Zone in my case), using the AF Area button located just to the side of the shutter release. 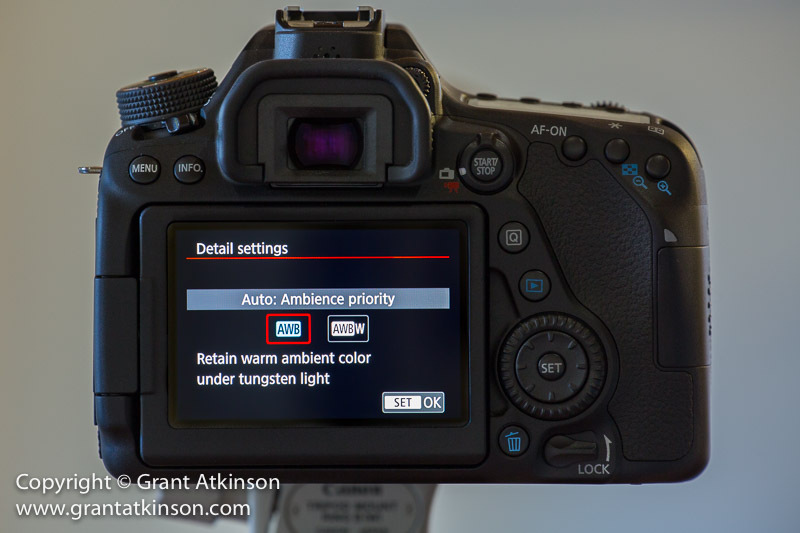 The camera needs to be switched on and active, for the AF Area button to function. Pressing it once will illuminate the viewfinder as well as the AF points in red. Pressing it again quickly will select the next AF area in the sequence. I keep this setting on 0 so that I always have control of where my active AF point/s are. Choosing option 1 or 2 will make the camera automatically choose different, pre-selected AF points and groupings when you switch from shooting horizontal to vertical. I disable Color Tracking, which is most useful in 45 Point (and AF Zone) focusing. Colour information from the cameras meter is used to assist focus tracking. I keep my 80D set at 0: Stops at AF area edges – which means that if I am moving a focus point all the way to the edge of the 45 point grid, and I keep moving it towards the edge, it will stop when it reaches the outermost ring of points. 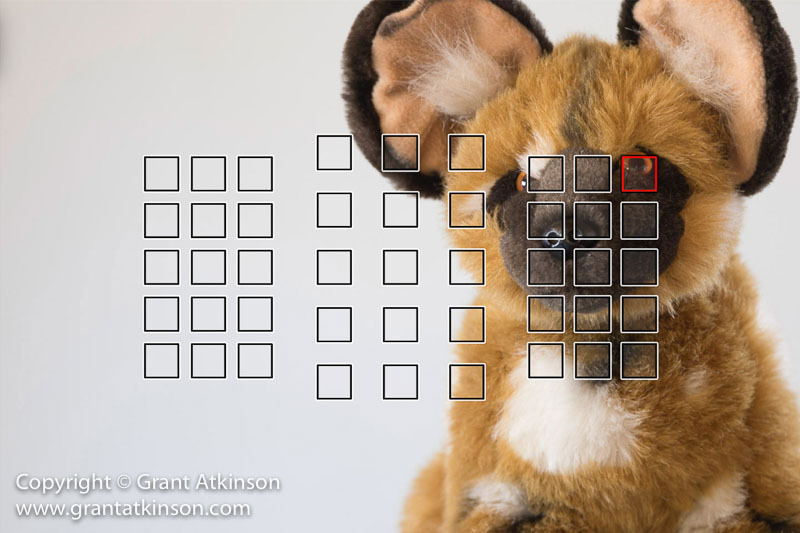 Choosing option 1 will allow the point to shift right acroos to the opposite side for the AF grid. 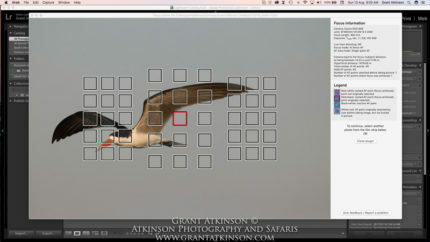 This screen allows the user to choose how the viewfinder will display the autofocusing points. It really comes down to personal preference, and mine is option 1: All (constant). This means that when I look through the viewfinder, all 45 of my AF point locations are visible as small black outlined squares. The selected point/s are shown in a thicker black outline that is superimposed on the smaller squares of the grid. 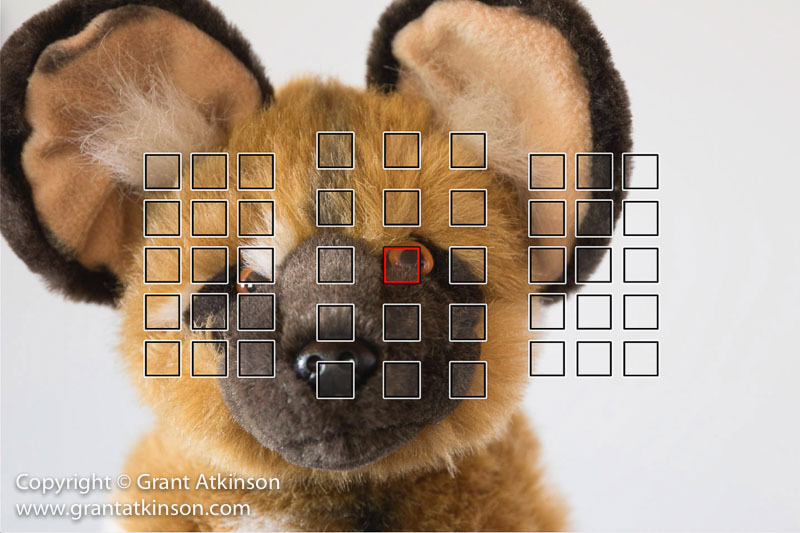 Choosing option 1: Enable on this screen will allow the 80D AF grid points to light up in red when focus is achieved, if you are in One Shot focus mode. 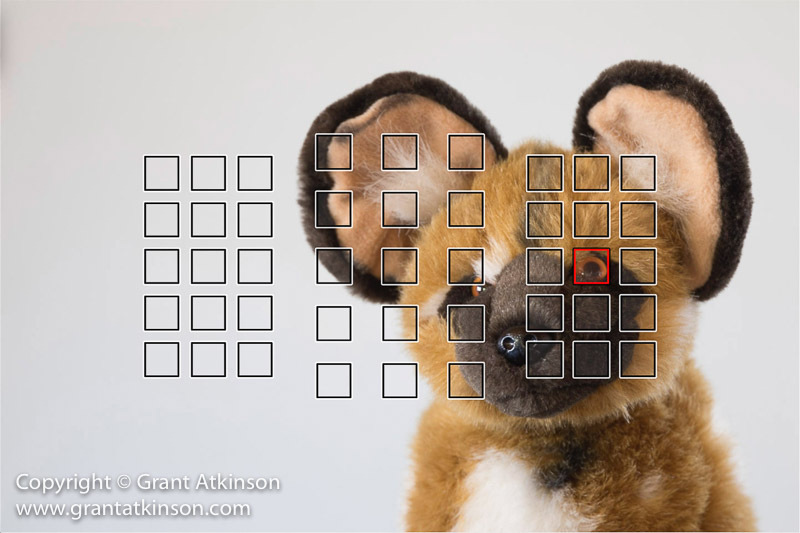 In Ai Servo, if you cannot see the focus points clearly in low light, pressing the right rear AF button on the camera back will cause the grid to illuminate momentarily which can be helpful. For C.Fn III: Operation /Others, only tab 4 is of interest to me, which is the Custom Controls screen, where I can configure the 80D to my preferences for buttons and controls. Displayed in the image above are my preferred control configurations. Starting on the top left of the two columns, with the shutter button. In my configuration, the shutter button actuates focus and metering. the AF On button and * button on the back of the camera work as AF-Off buttons. When I am in Ai Servo, I can focus with the shutter, but should i need to lock the AF point (as occasionally happens to me when in Ai Servo) I can accomplish this simply by pressing either one of the AF-On button or * button. Focus will be temporarily halted so long as I keep the button depressed. I keep both buttons configured the same in case I press the wrong one whilst shooting. This screen is also where you can set up the camera for back button focus if that is your preference. Beneath the AF-On and * buttons (in the Custom Control screen) are two buttons that I ignore mostly. The next important one for me is on top of the second column, the Set button. The Set button is configured for Exposure compensation whilst in M-mode and Auto Iso (press Set and turn the front command dial). I set the front command dial here, for changing aperture value (shown as AV) when I am in Manual mode, and the large rear command dial for changing shutter speed as depicted on the rear screen above, (also when in Manual mode). The last control enables the circular pad on the back of the camera (around the Set button) to shift the focus points directly without pressing any buttons first, just by tilting it (which is a bit fiddly on the 80D). I have illustrated this post with some high-quality wildlife images taken with the EOS 80D by Brendon Jennings, of Kariega game reserve. Brendon uses his 80D as a second body in the field. He has had his 80D in the field for longer than I have and kindly shared some 80D captures with me. I have also supplemented the imagery in the post, with images from my own 80D camera. The 80D is a very capable, and highly featured camera. For a camera in this range, it has very good autofocus, decent continuous shooting capability, an adequate buffer capacity, as well as excellent resolution for print, and good image quality. Whilst I set the camera up for my kind of wildlife photography, it can also tackle many other photographic tasks with ease, especially if one spends a few minutes getting to know it’s menus and option screens. Hi Thanks for sharing the information for Canon-80D. I use 6D and find very useful for all info. share here on preferred setup for wildlife photography. This is a great post. It’s extremely comprehensive and well set out. Being able to see the screen shots of the camera menu settings, then having your explanations as to how that settings effects the way the camera operates, is very useful. The added bonus is your explanation as to why you made that particular choice as a wildlife photographer. I thought I had a handle on tracking settings, auto focus point switching etc, but your explanations of how they operate and their use in wildlife scenarios was enlightening, and it emphasised the need to really consider what’s happening at the time of taking the shot and quickly select the most appropriate setting for the circumstances. I have actually put these three settings into ‘My Menu’ so I can access them more easily and alter them quickly, but I must confess that I get lazy and tend to stick to the same settings. I can see that I need to practice using these settings more. I have watched your videos on YouTube for how you set up your 5DMKIV and the 7DII and those too were very good, but I have to say being able to sit down and scroll through a post like this, is very, very helpful, particularly as I intend to get my camera out and sit down with this post as I scroll through the menu. There is a lot of really useful information in here, that gives much more information than is available in the camera manual. Your explanations of some of the menus functions are useful for users of other Canon models too so I do hope other people pick this up and read through your post. Lastly, I can see this has taken a lot of work on your part, so thank you for sharing. Another brilliant guide Thanks Grant for the time you spend doing these guides they are a huge help and save people months of time trying to get their cameras dialed in. You have a great way of explaining stuff in a simple to understand manner without over complication. Thanks Grant hugely appreciated. I was battling with exposure compensation in manual mode. I would love to be able to print this article . Thanks for your fantastic guide. 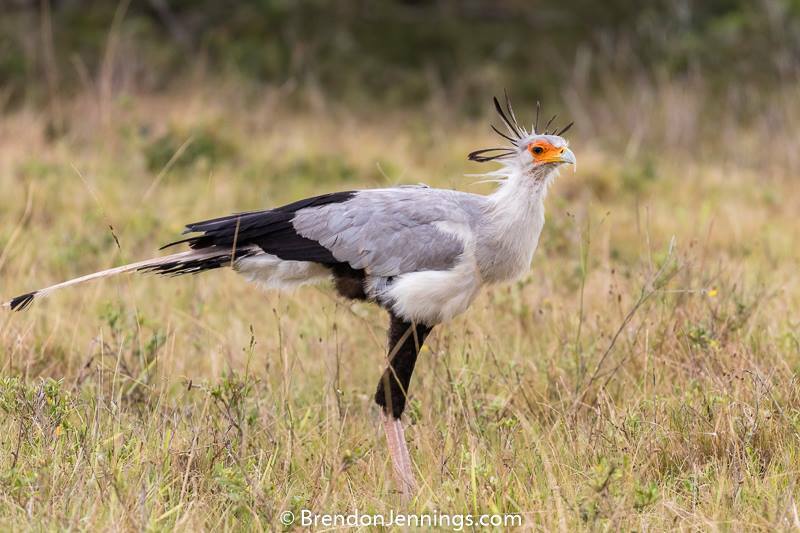 I have just returned from Langebaan where I took a lot of photos of birds. If I had only known then what I know now my photos would have been a lot better. I still have problems with focus on a Yellowbilled Kite against the blue sky. I use an 80d with a 100-400 mark ii. We are lucky to have a person with your knowledge and skill in South Africa. Greetings Grant! Really love your site and beautiful images! I’ve decided recently to upgrade my camera gear for my upcoming safari. I’ve decided on getting the Canon 100-400mm mk ii lens. My dilemma is which body to get! I really want good image quality and the ability to shoot at higher ISO. 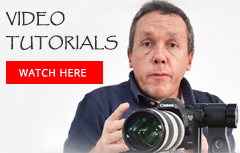 The question for you is do I get the 80d or the 7d mark ii. 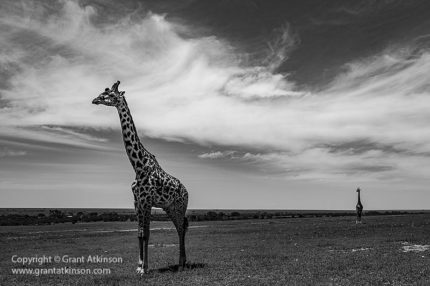 I shoot mostly wildlife and plan to visit Africa as many times as possible (I’ve already been twice). Hi Jason, excuse my late response, am in the field. The 80D is about a third of stop to perhaps half a stop cleaner than the 7Dmk2, to my eye, and most noticeable when shooting from iso 800 upwards. So on pure image quality terms, it holds an advantage. However the 7DMk2 has a much more responsive set of controls that allow me to keep my eye to the viewfinder more easily, and I miss far fewer shots because of that. The high speed drive and bigger buffer of the 7DMk 2 are big advantages if you like shooting action, and the 7D2 AF is more accurate when light gets low. The 80D is more versatile with its swivel screen for getting different angles when using Live View..
Based on those key attributes, i would make my decision. Hi Grant thank you for this most helpful tutorial! It has helped me so much in the set up of my camera. The fact that there are visuals to accompany the explanations helps even more! I’m a new photographer with tons to learn but I do know that I have a very nice camera and this tutorial has made me so excited to now go out and practice!!!!! Can’t wait to try taking photos with my new settings, a lot of which I never even knew existed! Thanks again!!! 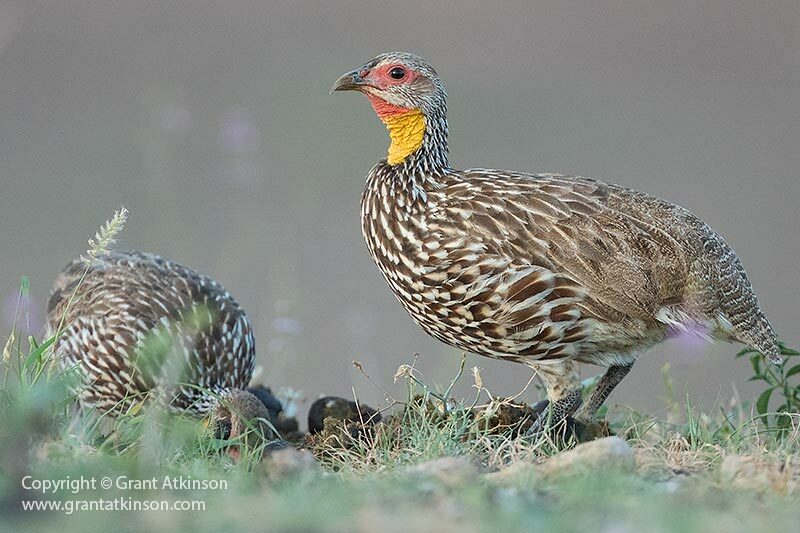 The 80D has Canon’s best crop sensor yet when it comes to resolution as well as low light image quality, so it is a seriously good camera for wildlife, especially at it’s price point. Hope you enjoy using it and hope to see some of the images you get ! thank you for a fabulous post, most informative and answered all my questions. I am already seeing improvements in my photos since following your recommendations. Really appreciate the time and effort you put into this, especially the many, many screen shots. Thanks for the really helpful article. Trully appreciated! I am planning to use the 80d + 1.4x III + 70-200 F4/L IS for a safari to Kenya/Tnazania in September. Do you reckon that the 80D with this combination will be an acceptable setup for this lifetime experience ? Hi George, Thanks for writing. I think that with the combination that you describe, you ought to have a fairly lightweight setup that will allow you to come away with good images. Without knowing exactly which parts of Kenya and Tanzania you will be visiting, and the photographic conditions you will be working in – for example will you be able to go off-road to get closer to distant animals, will you be able to be out before sunrise etc, i would say that your gear combination is a good one. 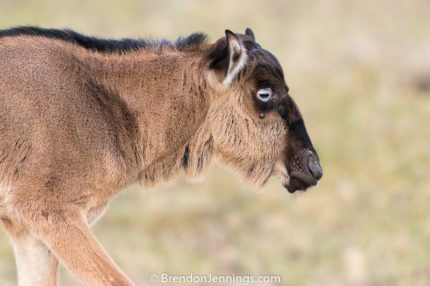 I would think that for some of the smaller animals, as well as in places where you cannot leave the road, that you may be a little bit short of focal length. Typically, in the better viewing areas though, you are likely to encounter many or some at least, of the more interesting animals close enough for that lens. A good number of the more sought after African mammals like lions, elephants, giraffe, cheetah, zebra for example, are all quite big which helps with photography. With regard to your combinations capability to gather light, the 80D with 70-200 and extender will have a maximum aperture of f5.6, which is adequate when the sun is unobstructed. 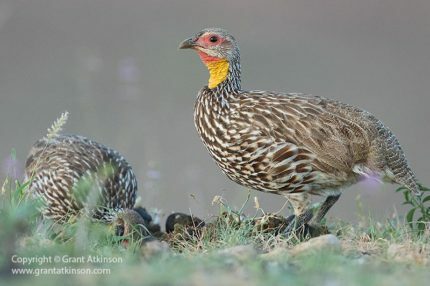 If you do get opportunities for photographing wildlife before sunrise or even after sunrise, that maximum aperture combined with the crop sensor might be a bit limiting, but you could always remove the EF extender to get back your f4 aperture and you could also swop out the 6D with the 80D for extreme low light situations. 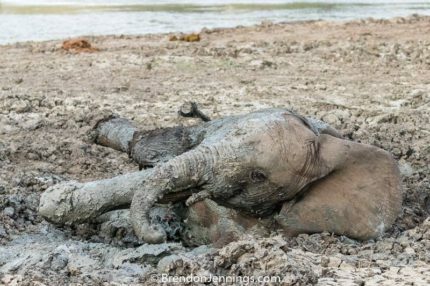 Whilst it can be dusty in some African safaris it is not always so and it is still possible to change lenses etc in the field with a little care. 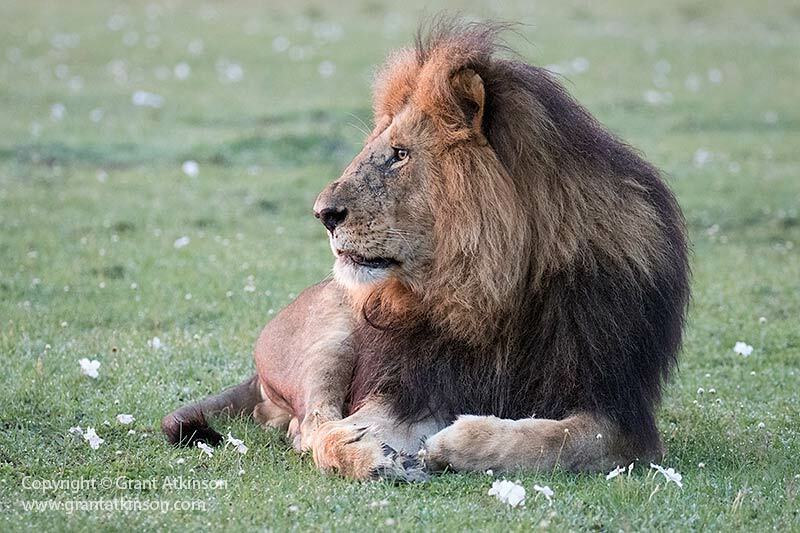 We are visiting the Masai Mara/North +Central Serengeti/Ngorongoro (9-10 days) during mid/end September so that we can experience the great migration . 1.6 x 1.4 x 200 = 448 mm – (of course I won’t have much room to play in post). Is it not enough for these areas? Thanks for adding the location information, so for most of those areas I would expect that you will be staying on the roads and tracks most of the time. What will an advantage to you is that in those two reserves, Mara National Reserve and Serengeti NP, the majority of the wildlife is very approachable, and most animals are not very shy. 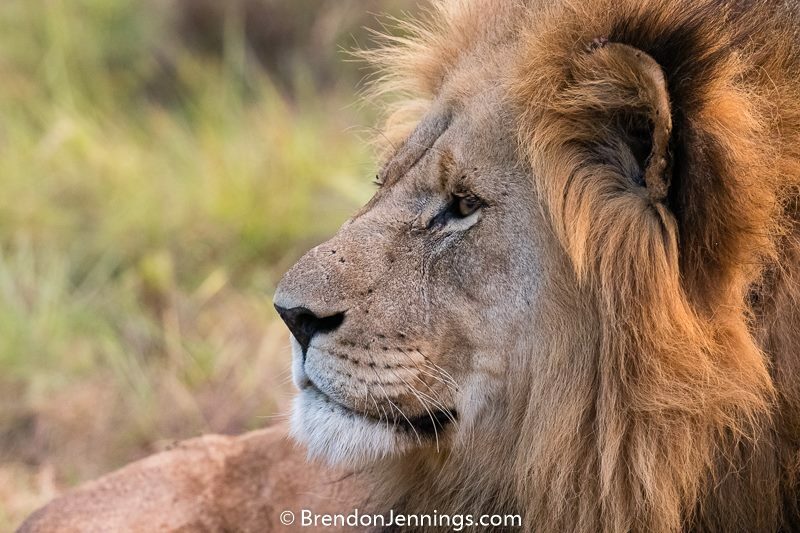 For myself, my most used heavily used focal lengths on my trips to the parts of the Mara and Serengeti where no off roading is allowed, are 400mm to 560mm (that data is from my image folders in Lightroom from trips there over the last three years), and based on use mostly with full-frame cameras (5D Mark 3, 5D Mark 4, 6D Mark 2 and 1DX). As far as a blog post on field of view and crop sensor compared to full frame, i have considered it so many times but i always avoid writing such an article because there is so much confusion amongst wildlife photographers surrounding that topic :-). We do own and use Canon APS-C camera bodies, but we ourselves are happiest with the results we get from them when the iso settings are at iso 1000 or below. Above iso 1000 we would prefer to use a full frame Canon body, but of course there will only be a quality advantage to the full frame camera if we are framing the subject without having to crop a lot. If we have to crop away more than half of every frame we take because we are always far away, then we may as well start out with a Canon APS-C camera with smaller sensor in the first place :-). For sure it can be complicated. Hi George, as you already know these things are always a trade off in some way or another :-). So it can be hard for me to recommend what other photographers should or should not do. Even my own gear is a kind of trade-off, as I carry the EF 500 f4 L IS ii and the EF 100-400L f4.5-.5.6 IS ii and a wide angle on the majority of my trips. For sure there are many occasions when i would get better image quality in low light, and better resolution on far away subjects if i instead had the EF 600 f4 L IS ii and the EF 200-400L f4 IS Extender lens, but those two lenses cost a lot more than the two i have, and they are much, much heavier! So with my EF 500 and EF 100-400 combination i know that when the light is low, i am forced to shoot at higher iso with the EF 100-400 and its slower aperture, but I accept that trade off :-), and I also feel that at some point, you only have to be happy that the equipment you have is giving you images good enough for your own requirements :-). I also just looked at my image files from Tanzania and Mara areas to see my most used ISO settings in case they are of any assistance to you. For the last few years of those two regions, my band of most used ISO settings ranges from iso 320 up to iso 3200, with some 5D Mark 4 and 1DX images at iso 4000- iso 6400 as well. It may be worth noting though that a lot of our shooting takes place very early and very late in the daylight hours when carnivore activity may be more prevalent. We also try to seek out action opportunities rather than sleeping animals where we can, which also leads us to shoot slightly higher iso settings. I’m thinking of upgrading my 60D to an 80D. I tried an 80D in a store yesterday and didn’t get how the ZoneAF (9 point) works. Rather than a “solid” cluster of 9 points, the main square in the block shifted around when pointed at a subject, as if it was trying to decide what to focus on. Is this how it works, or was it on a special setting? I thought the idea of ZoneAF is that it works as an expansion of single point. Hi Jay, Zone AF is a group of focus points, either 9 or 13 depending on which Canon camera you are holding, that work automatically to focus on whatever the camera finds has the most contrast or is closest, that is covered by those points. The way you saw it working is the way it is meant to work. When using Zone AF, you cannot choose which single AF point will lock onto a subject. Advantages of Zone AF over the fully automatic autofocus where the whole 45 point autofocus grid is active searching for the closest or most contrast strong subject are that with Zone AF, you can easily move your cluster of points to just one part of the frame, which would be where your subject is. The Zone AF cluster can be moved quickly from one side of the frame to the other. However, I prefer to only use it when my camera exposure settings mean that I am shooting with enough depth of field, that I am not relying on pinpoint focus location. On the 80D, if I am using a long focal length telephoto lens at an aperture setting of f4, with minimal depth of field, and I need to focus on a leopards eye, I will use Single Point AF. On the other hand, if I am shooting an aircraft flying by steadily in a clear sky, and I might be shooting at f7.1 or f8 aperture giving me lots of depth of field, then I might use Zone AF. I also use Zone AF on wide-angle lenses when I have subjects very close to the camera as it can allow me to move my general area of focus with just one touch on the focus pad. This is a hugely helpful post not least because it reveals more of the functionality for me. I noted that the 80D features colour tracking in the focus features. I will read about this again tomorrow and experiment. I’m hoping it will improve my pictures of a certain group of red aircraft here in the UK over the coming weekend! Hi Gordon, glad the post was useful. If you make use of the Auto 45 point focusing of the 80D and are photographing brightly coloured aircraft, then I am sure that there will be value in keeping the Colour Tracking enabled on the 80D. Usually the flight paths of aircraft are quite predictable, and they are also hopefully close enough to you that they will be big enough in the frame to track well.